BEAVERTON, OREGON, December 14, 2017: Audio Precision today announced support, in collaboration with Mentor, a Siemens business, for multichannel audio performance testing of A2B systems and components. A2B (Automotive Audio Bus®) is the digital audio bus technology developed by Analog Devices, Inc. to deliver high-quality audio over an unshielded, twisted-pair wire. By distributing audio and control data together with clock and power over a single wire, A2B significantly reduces the weight of existing cable harnesses (by upwards of 75% in key applications), resulting in improved vehicle fuel efficiency. An example use case of closed-loop A2B® audio testing through the combined capabilities of Audio Precision’s APx500 Audio Analyzer System and Mentor’s A2B Analyzer System. From simulation and bench testing in early-stage development, to validation and production testing, having a closed-loop system to measure audio and dynamic signal performance over an A2B network is an integral part of incorporating the bus technology into next-generation automotive systems. 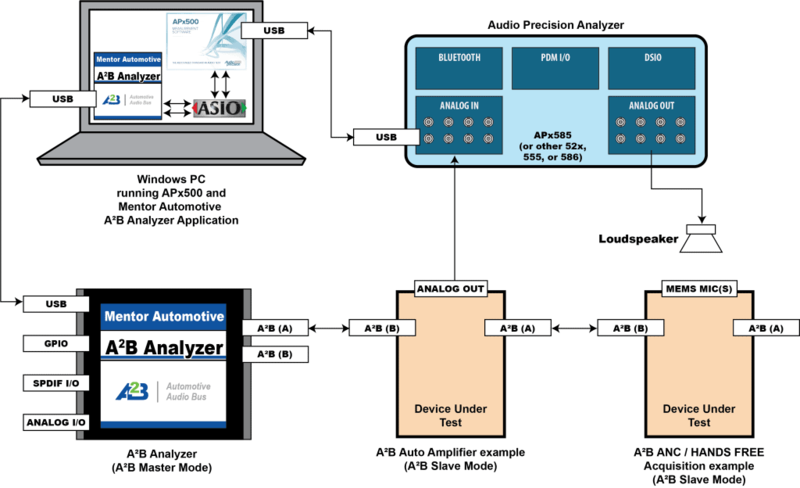 By combining the capabilities of Audio Precision’s APx500 audio analyzers and software, and Mentor’s A2B Analyzer System, software and ASIO driver, developers can easily create a complete, closed-loop multichannel A2B audio test system. Within this test system, the Mentor analyzer platform provides straightforward A2B network configuration and simulation, as well as flexible routing, and high-fidelity audio. The APx audio analyzer delivers comprehensive, multichannel audio measurement analysis and offers a wide range of interface options, including analog, Bluetooth®, digital serial (TDM) and PDM. Working as a complete system, these tools eliminate the effort required to develop, and support, in-house, custom test solutions. Mentor is a long-established automotive systems supplier, engaged with nearly every leading OEM and Tier 1 supplier, and providing design tools and embedded software in the areas of connectivity, electrification, autonomous drive and vehicle architecture. For additional information regarding the Mentor Automotive A2B Analyzer, software and ASIO driver, visit https://www.mentor.com/embedded-software/xse-automotive/a2b/. Audio Precision (AP) is the recognized standard in audio test. Since 1984, AP has offered high-performance audio analyzer instruments and applications to help engineers worldwide design and manufacture consumer, professional and industrial audio products. For more information, visit http://www.ap.com/. Automotive Audio Bus and A2B are registered trademarks of Analog Devices, Inc. Mentor Graphics is a registered trademark of Mentor Graphics Corporation. This entry was posted in News, Press Releases and tagged A2B, Automotive Audio Bus, Mentor Automotive by Eric. Bookmark the permalink.